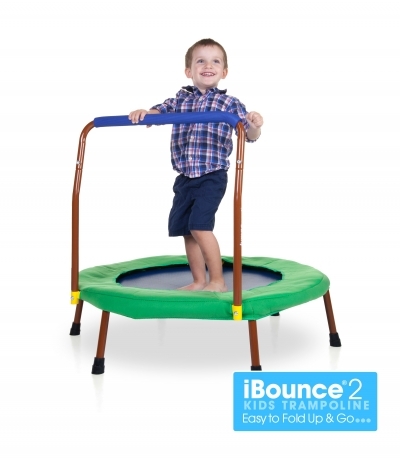 Get kids actively learning on the JumpSport iBounce2 Kid's Trampoline. Elastic bands offer a soft, lively bounce for little jumpers. Fold-up & go style for easy storage! Includes Rompy Roo: Where is Mr. Fuzzy? DVD. Perfect size for indoor . And DVDs will help all the idea of fun. This is cool for kids to get exercise. I like that it has a handle. Who wouldn't want their own personal trampoline? Love the colors! Safety handrail gives us moms a relief. The protective cushion to cover the metal parts is a great addition not only for injury free fun but also for a little one to have fun outdoors. The cushion will keep the metal parts cool even in the Vegas heat!